His brother was right next to him, but they couldn't even touch. 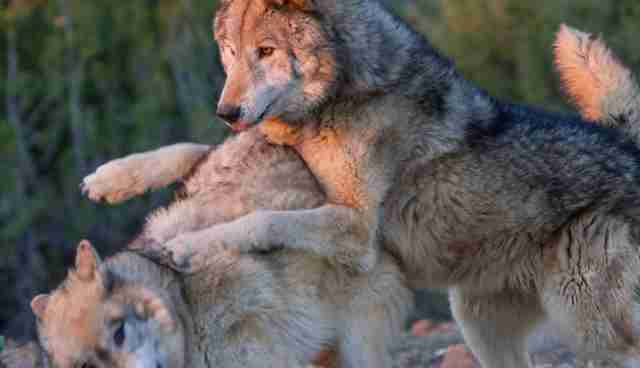 The wolf dog brothers saw each other every day, but they'd never been able to touch. The brothers - Chance and Koda - were less than 2 years old, and they'd spent their entire lives tethered to posts at the roadside zoo. When the temperature dropped, the heavy chains froze into the animals' fur. If the wolves walked in the opposite direction to the chain, the metal would rip fur from their necks. It was Maureen O'Nell's first day on the job as executive director of the Alaska SPCA when she got an email from an animal welfare group about the roadside attraction, called Wolf Country USA, in Palmer, Alaska. 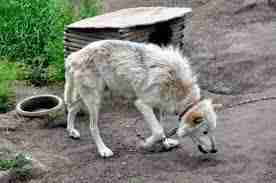 The attraction had 29 wolves and wolf dogs on display, all of them chained to outdoor posts with no access to shelter. 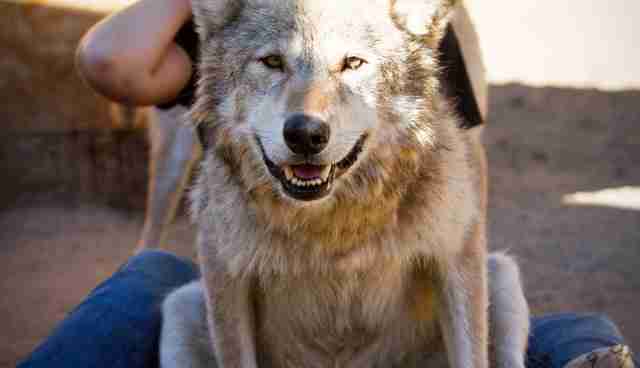 Guests could pay a fee to take photographs or throw the wolves treats. "[The email] was a mixture of a plea and a command, asking me what I was going to do about Wolf Country as the new director," O'Nell told The Dodo. "Wolves weren't an area of expertise for me or the team of spay and neuter professionals I worked with, and I certainly didn't know a thing about Wolf Country. That was about to change." 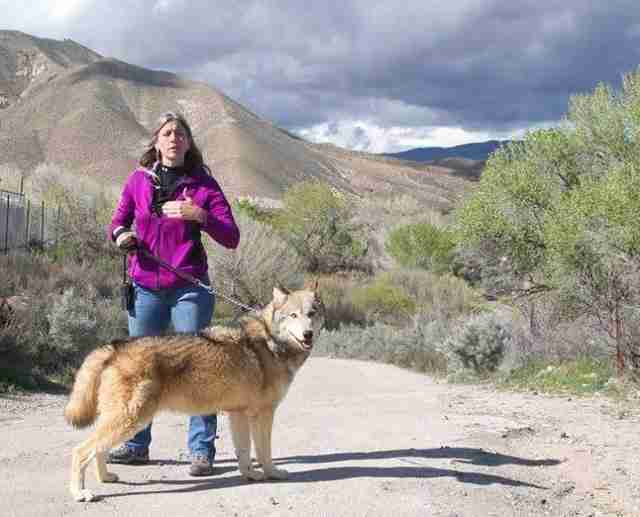 She learned that a new regulation had gone into effect making it illegal to keep wolves and wolf dogs in Alaska, so state authorities had shut the roadside attraction down. 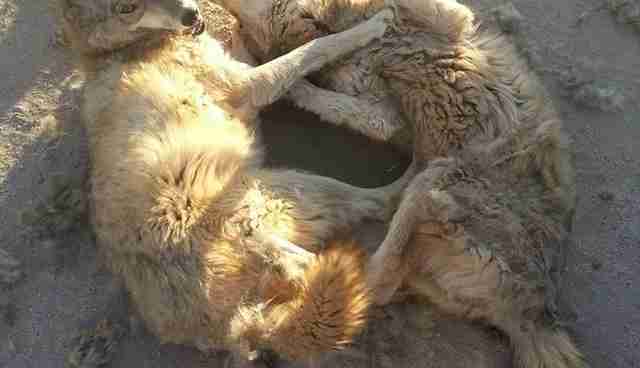 It was unclear what would happen to the 29 wolves and wolf mixes. O'Nell and the team at the Alaska SPCA knew they had to help, but it was going to be an ordeal. The 29 animals would need to be rehomed at certified wolf and wolf dog sanctuaries, and would need to be neutered before leaving the state. 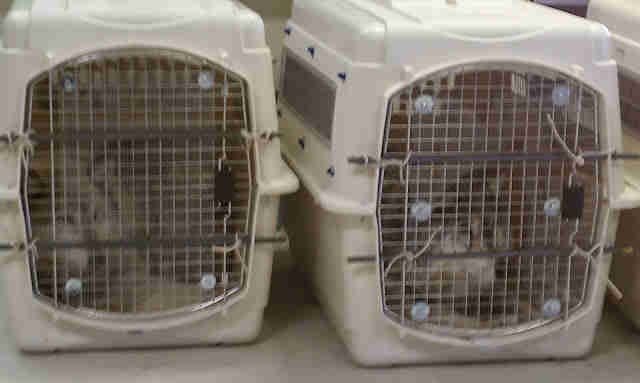 O'Nell and her team organized a truck, bought transport kennels and got a vet who agreed to perform the surgeries. 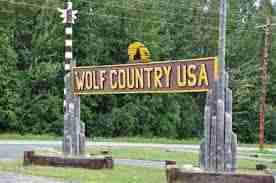 When O'Nell and her team arrived at Wolf Country USA, the first thing O'Nell noticed was the posts. 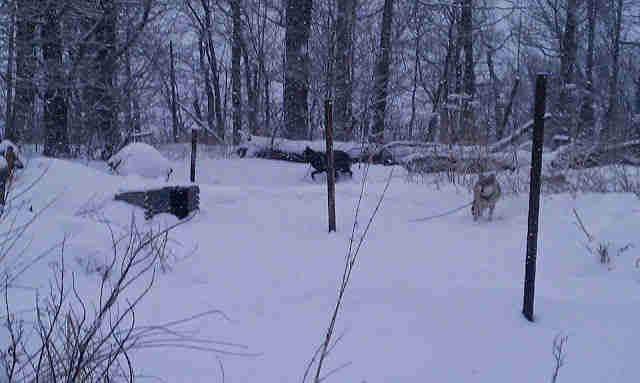 "I saw posts sticking out of the frozen ground and wolf after wolf circling the posts like some sort of bizarre geometric design. I handed out ice cleats to everyone ... knowing how packed the ice was, and how precarious trying to manage the terrain was going to be." The rescue operation began - kennels were lined up, bolt cutters came out and, one by one, the wolves and wolf dogs were freed. The Lockwood Animal Rescue Center in California took as many animals as it could, but soon reached capacity. 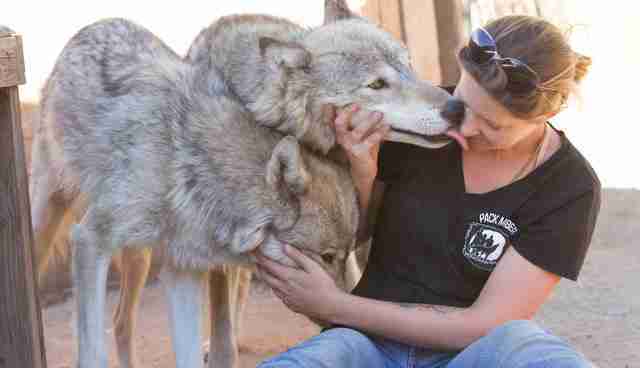 The group contacted Wolf Connection, a wolf sanctuary close to Los Angeles that also runs empowerment programs for troubled youths, and asked if the facility could take a couple of wolf dogs. 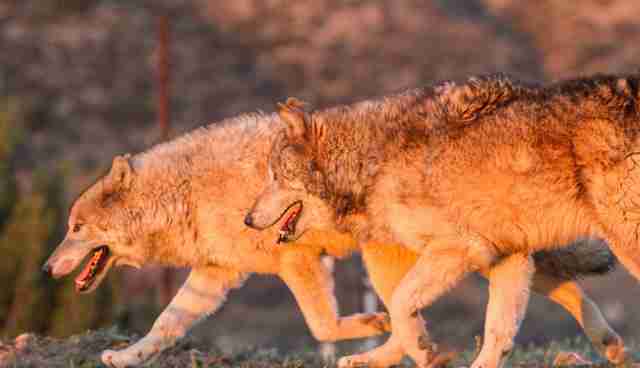 "Myself and another volunteer went to the facility to look at the animals," Renee Alfero, a behavior specialist for Wolf Connection, told The Dodo. "Chance and Koda were instantly scent rubbing and snuggling into us and allowing us to touch them - we knew in that moment that they were the two that we were taking." After spending years not being able to touch each other, Chance and Koda could finally interact. 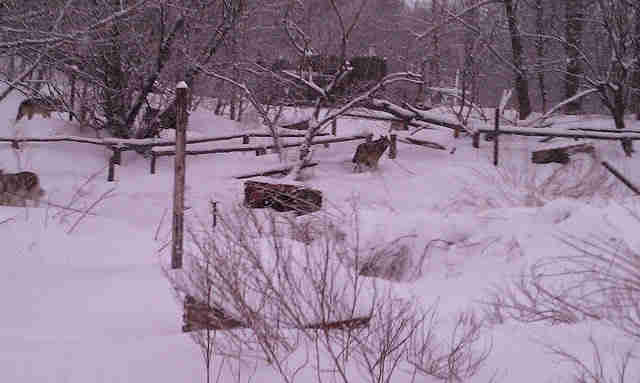 At their new home at Wolf Connection, they live in the same enclosure, where they can play and bump against each other. Chance, being the older brother, took on a more dominant role in their relationship, while Koda is more submissive. But Chance and Koda weren't without their issues - both animals suffered from post-traumatic stress disorder (PTSD) from their years at the roadside attraction. They hated being tethered to a leash, which undoubtedly reminded them of being chained to the posts. They were also afraid of objects like shovels and sounds like car engines. 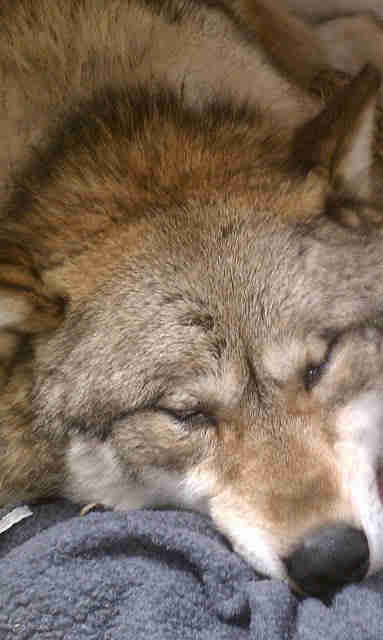 The team at Wolf Connection did everything they could to help. 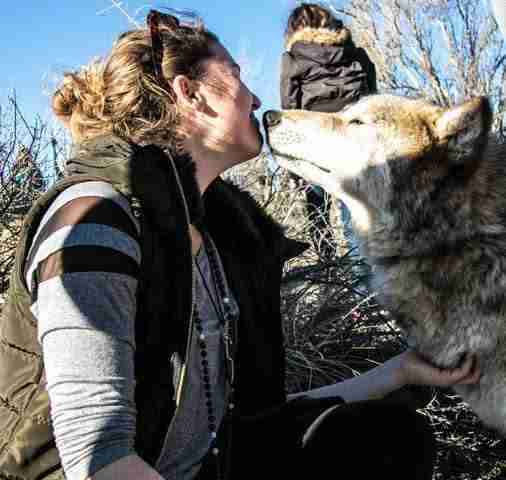 "Part of Chance's PTSD response was to walk in a circle in one direction, which is what he did when he was tied to the post," Giulia Cappelli of Wolf Connection told The Dodo. "So he was lovingly assisted by having the team member physically stop him from going in circles with a calm and loving hand placed on his chest. Then we would walk forward instead of in a circle." Over time, Chance and Koda got over their PTSD. Now they don't even mind being walked on a leash. But, soon after the rescue, Wolf Connection got some bad news. When Chance went to the vet for a routine check, the vet discovered that Chance had a massive tumor on his colon. The prognosis wasn't good - Chance was given 2 months to live. The Wolf Connection team was devastated, but refused to give up. They made arrangements to transport Chance to a Los Angeles clinic for radiation treatment five times a week, and showered Chance with love and attention when he was home at the sanctuary. With Chance sick, they worried that Koda might try and take on the dominant role, which would stress Chance out, so they started keeping Chance and Koda in separate enclosures. When they did allow the brothers to interact, they got the biggest surprise. "What we found instead was that both of them were working so hard to maintain the status quo," Cappelli said. "As hard as Chance worked to remain dominant, Koda was also making a great effort to remain submissive. This continues to baffle us and at times brings us to tears at how bonded they are to keeping their loving relationship just as it is. And we may never understand why." What's even more amazing, Chance has outlived his prognosis by six months - and he's still going strong. "We're beating the odds," Cappelli said. "In March, the radiation was palliative, and there was nothing they could do for him - that was it. That's western medicine's prognosis. Our prognosis is he continues to survive on a holistic approach and our loving attention to details and care." Chance and Koda also play an important part in the youth empowerment programs at Wolf Connection. 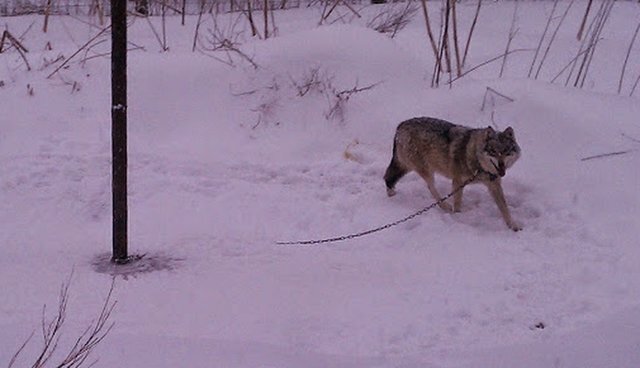 "Maureen [O'Nell] gave us some of the actual chains that were used on the wolves in Alaska," Cappelli said. "In our programs, when we tell the story of Chance and Koda, we use the chains with our participants to help them identify what chains them in life, what they need to let go of. Chance and Koda have inspired many, many people to break the chains in their lives." To help with Chance's health care costs, you can make a donation here. You can also help support the other animals at Wolf Connection by donating here.